Providing exceptional traction in a super light weight all purpose shoe is what the Ultra Lite Rim is designed to offer. Built on the successful St.Croix Plain Lite Rim shoe and nail pattern, this reduced weight and increased traction shoe is ideal when shoe weight is of primary concern. The generic shape is easy to modify and features a crease from heel to heel. 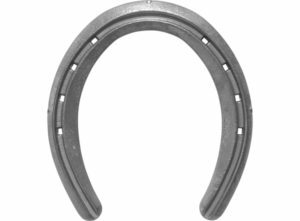 This shoe is punched for an SB5 nail.